Welcome to FALL! One of the things I love about fall is the ability to turn on the oven without needing to also turn on the air conditioner to counteract the heat overload in this very small apartment. A couple of nights ago I made a dish using spaghetti squash for dinner and consequently had half a squash left over. What tends to happen with me is that I make a meal for the sole purpose of using up something left over in my fridge (a few days ago it was cherry tomatoes), and then end up having a different leftover ingredient. So instead of just throwing some sauce on the squash like I usually do, I started looking for other ideas and came across a picture of spaghetti squash “mac & cheese.” Yes please! But the recipes I was finding mostly used reduced fat cheese. I have a theory about reduced fat or fat-free cheese: don’t do it. I’d much rather eat the fat and all the flavor that comes with it than the chemicals they use to remove the fat from the cheese. If you don’t want to eat the fat that comes with cheese, just don’t eat the cheese. So, without further ado, my own version of FULL FAT Spaghetti Squash Three Cheese “Mac” & Cheese! (It should be noted that I added broccoli not to make it “healthier” but because I thought the color and texture contrast would be nice and I also happen to love broccoli that’s been slathered in cheese). If you do not already have leftover spaghetti squash, you’ll need to obtain one, medium sized, and slice it in half (carefully! I almost lost a finger cutting a raw squash in half once), and scoop out and discard the middle goop and seeds (or save the seeds for roasting for snacks). Preheat the oven to 375. Spray the squash halves lightly with olive oil and turn them upside down (so the peel is facing up) on a baking tray and bake for about 30 minutes. Once it’s soft, scoop the strands out of the shell with a fork. While the squash is cooking, warm 1 cup of milk in on the stove with about 3/4 cup each of grated sharp white cheddar and gruyere until the cheese begins to melt. Whisk until all the cheese is evenly melted,.remove from the heat and whisk in 2 Tbsp flour. Let the mixture cool a little, and then stir in 1/4 cup plain Greek yogurt and a pinch of salt, fresh pepper, and nutmeg. Combine the sauce with the spaghetti squash “noodles” in an oven safe dish. Add your broccoli if you’re using it (or spinach); I used organic frozen broccoli florets and defrosted them ahead of time and squeezed out the excess water. Sprinkle everything with grated parmesan cheese (you could also add breadcrumbs or panko) and bake at 400 for 15-20 minutes or until the top begins to brown. I also threw on some red pepper flakes before it went in the oven because I like it with a little kick! Now enjoy your hearty fall vegetarian meal! Note: to make this gluten free, just use a gluten-free flour, like rice flour or tapioca flour. To make this vegan… uhh… sorry, I think you’re out of luck. 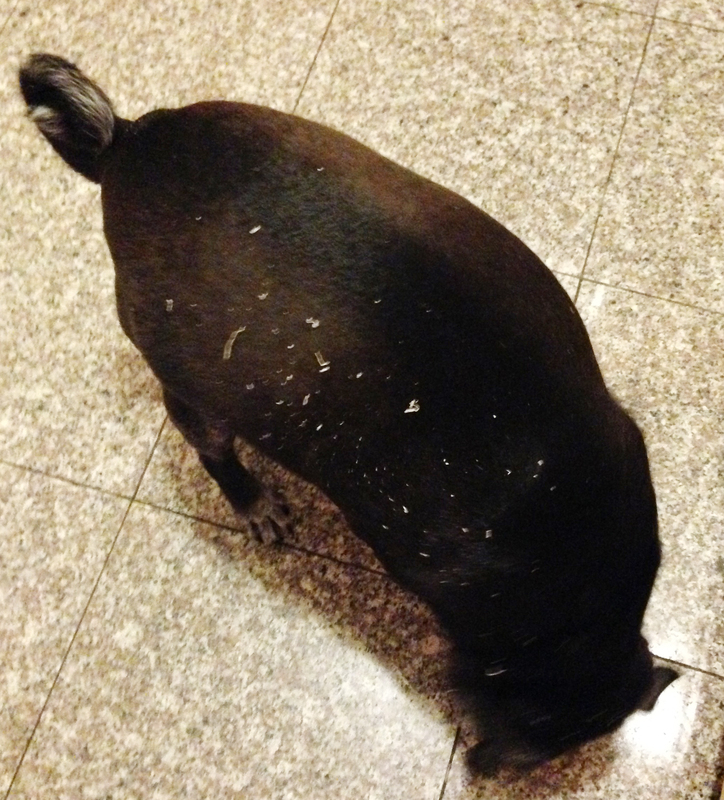 I’ve also included a pic here of my kitchen piglet: my almost-14-year-old pug who insists on standing under me as I cook so she can have first dibs on whatever hits the floor. Her back was covered in parmesan cheese! 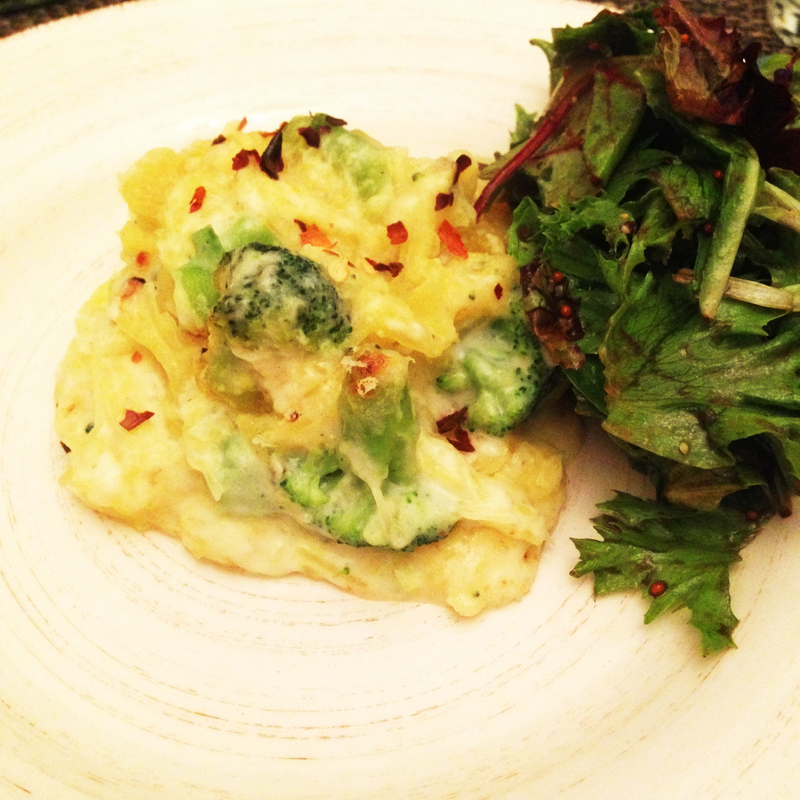 This entry was posted in Cooking adventures and tagged casserole, cheese, dinner, gluten-free, squash, vegetarian. Bookmark the permalink.